Papmas grass is native to Japan and China, it grows everywhere near rivers and in mountainous plains. It is one of the seven plants of autumn and as kigo best know in autumn, together with the moon. Kaya 萱 is an older name, kaya was often used to thatch the roofs of old farmhouses. Miscanthus sinensis (Chinese silver grass, Eulalia grass, Maiden grass, Zebra grass, Porcupine Grass; syn. Eulalia japonica Trin., Miscanthus sinensis f. glaber Honda, Miscanthus sinensis var. gracillimus Hitchc., Miscanthus sinensis var. variegatus Beal, Miscanthus sinensis var. zebrinus Beal, Saccharum japonicum Thunb.) is a grass native to eastern Asia throughout most of China, Japan and Korea. It is a herbaceous perennial plant growing to 0.8-2 m (rarely 4 m) tall, forming dense clumps from an underground rhizome. The leaves are 18–75 cm long and 0.3–2 cm broad. The flowers are purplish, held above the foliage. In early spring, many susuki fields are burned down to fertilize and make space for the new harvest. In many areas this is an activity of the whole community, involving the fire brigade to make sure not too much is burned down.
. Nobunaga Ki 信長忌 Nobunaga Memorial Day . 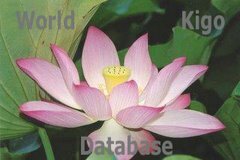 In a long vase in front of the alter the priests arrange long susuki ears and pine branches and hang small paper slips from them where the Amida Prayer is written. The service is in memory of Saint Ippen (Ippen Shoonin 一遍上人聖). Miscanthus tinctorius from Hachijoo Island. 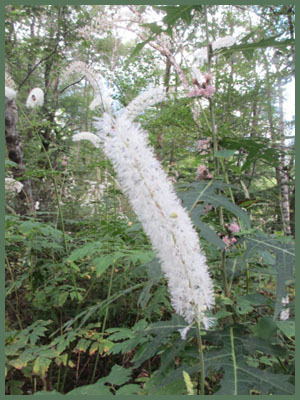 Extracts of this plant are used for dyeing cloth. ogi no koe 荻の声 'おぎのこえ) "voice of the common reed"
. shinigami wa binan narubeshi ogi no koe .
. Susuki matsuri 芒祭（すすきまつり）"pampas grass festival"
Here Basho refers to the fact that after a long and difficult journey he finally made it despite all odds, without meeting his death, to the town of Edo. 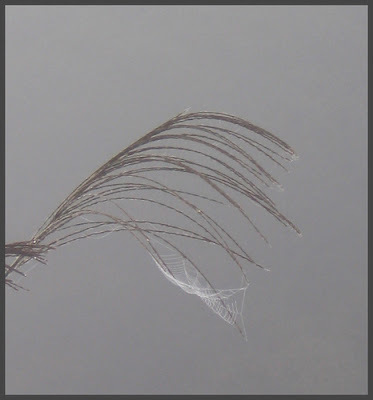 He may be getting old and fragile, like pampas grass bends in heavy snow, but he is still up and writing poetry. It will become so, there is nothing I can do about. Often used with reference to the death of a human being. a honkadori to the poem by Basho. This autumn hokku was found among Issa's papers after his death, so it probably comes from the final period of his life. The tall (3-10') susuki grass Issa is watching and listening to is often called "Japanese pampas grass," but strictly speaking it is miscanthus grass (Miscanthus sinensis). 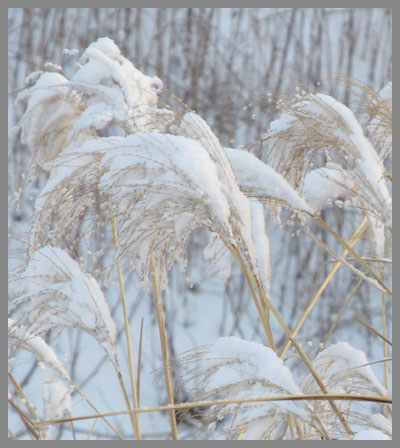 A look at photo will show that miscanthus is slightly slimmer than true pampas grass, and its tufts are more like soft tassels than the long plumes of the pampas grass, which can almost suggest spearheads. 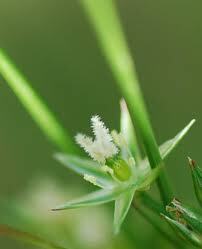 It is also different from eulalia grass. The most popular common names for miscanthus grass in English are maiden grass and Chinese silver grass, though susuki grass seems to be catching up. It grows in clumps, and in the early fall each tall but slender stalk puts out even more slender 6-8" tassels at the top that resemble golden cords. In dry weather the tassels are a bit stiff, though they bend and move in the wind. But when they are wet by rain the tassels often droop and hang down like long hair. Both the leaves of the stalks and the tassels rustle, but the sound from the leaves is stronger and in Japanese traditional poetry often suggests voices. In this hokku Issa speaks of whole stalks of miscanthus grass that have put out tufts of slender tassels at their tops. In virtually the slightest breeze the tassels move, and with a little wind the whole thin stalk also sways a little, so miscanthus grass has, since the days of early medieval waka, been associated being "slender-hearted" or having "slender hearts": being extremely sensitive, feeling a sense of general loneliness, having a tendency to feel anxious or forlorn or having feelings of helplessness. Being slender-hearted was regarded positively by waka poets and critics and believed to be a prerequisite for writing waka able to evoke the sublime, transcendent, mysterious beauty sometimes called yuugen. I wonder if Keats' "negative capability" -- "... when a man is capable of being in uncertainties, mysteries, doubts, without any irritable reaching after fact and reason...." -- wouldn't be one good translation for the openness to change and creative anxiety implied by "slender-hearted." Basho also talked of hosomi or slenderness in terms of the inseparability of beauty from anxiety, sadness, and change. The word Issa uses in line three refers to how this slender-heartedness, this restless anxiety and sensitivity of the heart-mind, express themselves physically. 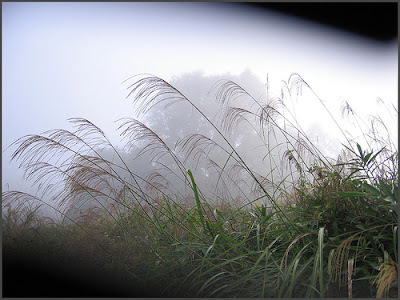 The rustling of the leaves and tassels make audible the trembling that is going on in the heart-minds (kokoro) of the miscanthus grass and no doubt in Issa's own heart-mind as he hears their sounds and sees their swaying. This is of course personification, but it also draws on the Buddhist belief that plants and trees have various forms of consciousness and can achieve enlightenment. I wonder if Issa doesn't recognize in the trembling, rustling heart-minds of the miscanthus grasses an open admission of some sort by the grasses of their complete dependence on the wind and on Amida Buddha. The miscanthus grass seems to teach Issa about the value of tremblings and rustlings in himself he wasn't completely aware of before. ashi no kiri 蘆の錐（あしのきり）"drill of ashi grass"
ogi no tsuno 荻の角 (おぎのつの) "horns of ogi"
The stem had been used to make wicks for oil lamps.
. gamamushiro 蒲筵 (がまむしろ) mat from gama .
. i karu 藺刈る (いかる) harvesting rushes . Igusa is the main material for the tatami floor mats. Tatami is made with a rush plant, igusa. Rush is planted in the rice fields in August. Tatami is made from natural igusa . . .
kisuge, ki suge 黄菅（きすげ） "yellow Suge"
. WKD : Bamboo (take 竹) . This hokku is from the 4th month (May) of 1812, when Issa was in the area just east of Edo. 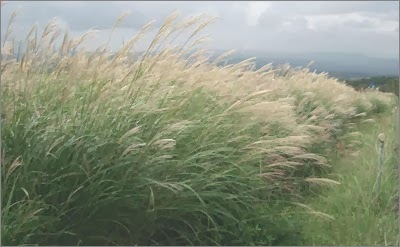 Susuki grass is often called "Japanese pampas grass," but, strictly speaking, it is miscanthus grass, which has thinner stalks and smaller, more delicate tufts than the large, spearhead-like plumes that pampas grass puts out. In haikai, miscanthus is normally an autumn word, since the grass is regarded as being more beautiful when it becomes drier and the cord-like tufts become fluffy and translucent. In this hokku, however, Issa is impressed by the tall grass in May, when the stalks and leaves are new and green. Even when the susuki grass has just come into bloom, Issa hears its complex waves of rustling sounds in the wind as a kind of strong excitement and desire by the grass to meet a friend or lover. The way the tufted stalks bend in the wind also resembles a beckoning gesture, though the verb sawagu suggests a level of sound that implies extensive rustling and leaf movement. "Someone" doesn't necessarily mean the grass wants to meet humans. It could imply that, but it also suggests desire in the grass between new green stalks. I doubt that Issa believed love and desire exist only between humans (and other animals). Sunami Shinsuke is the fourth generation of a family that has kept alive the techniques of weaving flower-patterned mats. ... A hit souvenir item that Sunami developed was the Kurashiki igusa basket, made from ropes of twisted igusa. are a famous spot ! Still trying to figure out where this was written.
. Suginami 杉並区 Suginami ward Tokyo . There are various theories about the name of this village. 1 - The area around 善福寺池 Zenpukuji-Ike pond and 妙正寺池 Myoshoji-Ike pond was a swamp where 藺草 Igusa was growing wild. 2 - ashi 葦 reed was growing in the ponds, then called ike no kusa 池の草. Ikenokusa was then shortened to イグサ Igusa 葦草. 3 - Between the ponds of Zenpuku-Ji and Myosho-Ji there was a grassland. Between pond 池（井）i and soogen 草原 grassland, using the Kanji 井草. 4 - The developer of the area was 長左衛門 Chozaemon, who used the family name 井口 Iguchi. He was also called 草分け長左衛門 Kusawake Chozaemon. kusawake, lit. "dividing the grass and weeds" is a pioneer in farming areas. His familiar name, Iguchi no Kusawake, was then shortened to 井草. Issa is referring to the cotton-like fibers produced by certain aquatic plants when they produce their seeds.